Many businesses evaluating their options for a new management solution often ask: how long does it take to implement an enterprise resource planning (ERP) solution? While there is no standard timeline for ERP implementation, it’s important not to rush through the process. Only a careful, deliberate implementation of ERP will reward a growing business in the long run. To provide a realistic expectation of how long ERP implementation takes, the first thing to understand is the process itself. 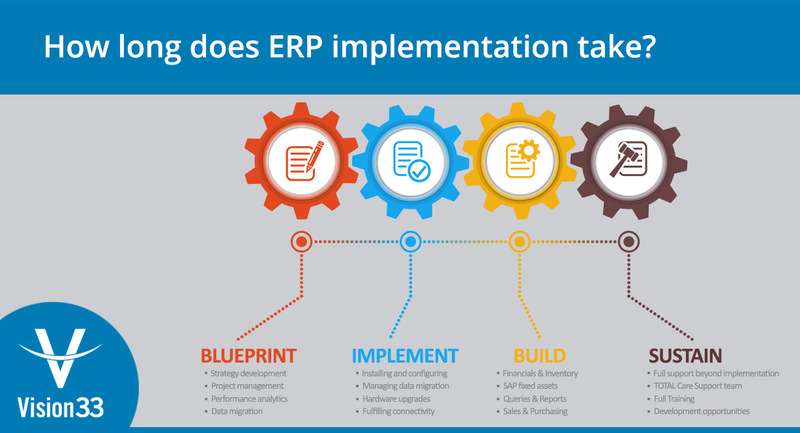 What Services are Included in ERP Implementation? Vision33 offers a simplified, yet comprehensive approach to ERP implementation that is based on proven methodologies and industry best practices that we’ve developed over 15 years. We deliver a four-part implementation strategy which includes blueprinting, building, implementing and sustaining the ERP system for your business. 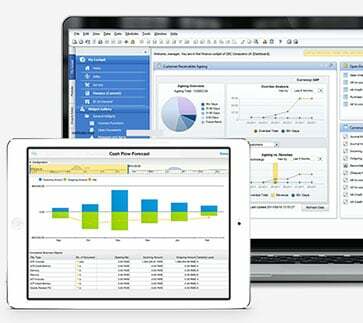 Vision33 consultants work in partnership with businesses to understand individual needs for an ERP solution. Our experience allows us to ensure your desired outcomes are met and that best practices are applied, from the pre-sales stage through implementation and post-project analysis. After blueprinting, the next stage is building the chosen ERP solution according to individual business requirements. This stage includes strategy development and execution, data migration, project management, risk management, and post-implementation review. Vision33 assists in the transition from a project-oriented, pre-production environment to a successful and live operation of the chosen ERP solution. We perform software configuration, system, and integration testing. We also facilitate flexible end-user training sessions (online or onsite) so that businesses can make the most of their investment in ERP. A live system isn’t the end of your new journey – it’s the beginning of new possibilities for your business. Vision33 provides full customer support beyond implementation, so you have access to experts whenever the need arises. Our experienced TOTAL Care Support team takes a hands-on approach to empower you to understand your ERP solution and make it your own. We also offer training and development opportunities so you can get the most from your system. The short answer is, it can take anywhere from several months to a year or more. Each business and project has unique variables that will affect an ERP implementation timeline. The implementation process is thorough because of the due diligence and risk mitigation involved. The four-part implementation strategy outlined above serves as a broad overview of businesses evaluating ERP options. If your business is considering an investment in new technology, know that the outcome of your ERP evaluation, decision, and adoption isn’t inconsequential. It’s an important decision for any business to undertake. While implementation timelines may vary, a precise implementation plan will serve as the foundation for your ERP solution. Once your ERP solution has been implemented, you will reap the rewards of the right technology for your unique needs. For more insight into ERP evaluation, read Vision33’s ERP Software Selection Guide: 6 steps to choosing the right solution for your business.